Greetings! I am James Stone, 61 years old, semi-retired and living in the lovely spa town of Harrogate in God’s Own County of Yorkshire. My wife, Julie, bears my foibles. My children, Alasdair and Kirsty, do their own thing. Presently going through about my fourth or fifth mid-life crisis, I originally decided to create this blog principally in anticipation of what some might call an adventure of a lifetime (others might say… WTF!). Time would tell. To deal with that crisis I am not indulging in a brand new sports car or Harley, dyeing my hair, turning to drink or a mistress or any of the other signs of such a crisis. No I had something far more interesting in mind; something I hoped I could achieve before my body fails me. As a child I was fortunate to be dragged around the world by my parents. By the time I was 6 I had been around the world and visited Australia, the UK, the USA and places in between. That engendered in me a love for travel. Two memories stick in my mind from those early years. These are the impressions made on me by the jagged skylines of the Canadian Rockies and the Southern Alps of New Zealand. Those impressions did not make me yearn to climb to the summits. Indeed, then, I probably did not even know that people even bothered to try to climb them. Perhaps it was just the grandeur of the scenery, the white snowcapped peaks set against a blue sky or the impossibly blue glacial lakes or the extensive forests. Certainly a seed was sown. But the growth from that seed was slow. During school and university hockey was the focus of any physical activity. I even made County U21 level (just) and my University (Exeter) won the national universities’ competition in each of the three years I was there. Then the greasy pole of professional life deflected my attention. I could not maintain the commitment required for hockey; by my early 30’s I was also past whatever prime I may have had. If hockey was to be given up and I needed to look for another pastime. Years before, on our honeymoon, Julie and I had climbed Ben Nevis. Well, it was there to be done and being the highest point in the UK it was a noble objective. We were raw, inexperienced and, by the time we reached the bottom of that mountain, soaked. I still remember the soggy footprints on the hotel carpet left by our sodden socks as we crept in unnoticed after that climb. Hill walking, as it still was then, remained just a pastime. We would make occasional forays into the Peak District which was close to our home then in Sheffield. We would also visit The Lake District and, if we were feeling more adventurous, Snowdonia in North Wales. The mountains of Scotland inspired feelings of awe. We did not feel up to tackling them then. Then in 1983 that seed was fertilised somewhat. We were due to travel to Australia and Julie bought me a book to read on the plane. By the time we left on our trip however I had opened the book and devoured it. The book was Hamish’s Mountain Walk by Hamish Brown. It is an account of one man’s solo self-propelled trip of 153 days over all of the Munros. The book is much more than a description of the walk. It also covers the history, culture, geology, flora and fauna of the land he passed through and the people who lived in the Scottish Highlands. It also shows the influence that being out in that environment has. On our return from Australia our forays into the hills of England and Wales intensified as the hockey diminished. In a couple of years we had well covered the high points of the Lakes and Snowdonia. But we had not returned to Scotland. So in 1985 I had the bright idea of us doing a winter mountaineering course in Scotland. Such a course would teach us the hillcraft required for scaling the mighty Scottish peaks and how to be safe in winter conditions. It would also improve our confidence overall. The course was memorable not only for one of the most uncomfortable nights of my life (“sleeping” in a snow hole) but also re-opening my eyes to the grandeur of snow-capped mountains. The course coincided with some superb extremely cold but sunny weather. OK so the Scottish mountains may not be quite the same as the Canadian and New Zealand ones. However, with some imagination and in the conditions we had the West Highlands could just about compare. By the end of the course, I was hooked. For those not in the know, the Munros comprise 282 mountains in Scotland over 3,000 feet (914.4m) in height. At that time fewer than 500 people were known to have climbed them all. Then, I did not know whether I would manage them all but, needing a focus outside of work, I thought I would have a go. And so a passion (some – especially my children – would say obsession) flowered from that seed. Visits to Scotland were frequent – sometimes whole holidays were taken there. On other occasions we would leave after work on a Friday, spend two nights sleeping in the car and be out in the hills during the Saturday and Sunday and then be back at our desks on Monday morning. I was lucky that Julie was happy to indulge me. My good friend, Sue, was there too on occasion especially when some of the trickier mountains on the Isle of Skye were attempted. Six years later in July 1991 on Carn Mor Dearg I had climbed all of the Munros. I was probably within the first thousand to do so, appearing as number 892 on the list of “compleaters” maintained by the Scottish Mountaineering Club. By the time I finished them all Julie was not so far from completing them all herself. Seven years and the arrival of two children later she herself completed the Munros on Ben Wyvis in May 1998. In 1990 my parents had emigrated to the USA. Now Texas (where they moved to) does not hold that much interest to the mountaineer. But we found ever more ingenious means of getting there – e.g. via Colorado and its Rockies – or moving on to the high desert lands of the western states after a visit to them. This gave me some limited opportunity to climb higher objectives and to experience altitude. In 1996 I also climbed the east summit of Mount Elbrus in Russia with my brother, Derek, and sister in law, Cathy – a peak 18,441 feet (5,621m) high. These experiences both fascinated me (in terms of the effect of altitude on the body) and showed me how little I knew about this aspect of mountaineering. We now jump forward to a few years back. A degree of disillusionment on my part had set in in my working life and I found it difficult to keep myself motivated. So I decided to slide down that pole. Over the years I had also been giving moral support to two other friends, Cozi and John, in their quest to complete the Munros. So by Easter 2014 I myself had climbed all of the Munros for a second time – a cause for celebration! Fantastic weather blessed the occasion. A party of 23 and two dogs were on The Saddle with me for that event. Having more free time enabled a project to gestate in my mind. In today’s parlance I guess some might call it a bucket list. Anyway a series of mountaineering objectives coalesced. Could I tackle these whilst I might still be fit enough to do so? The project would also enable me to visit parts of the world I had long wanted to go to including Mexico and South America. Coincidentally brother Derek had separately been considering a similar journey. So when in March 2014 I received an email from him wondering if I might be interested in collaborating on a trip to some of the higher parts of the Andes, it did not take long for me to say “yes”. A short negotiation later we had an outline itinerary agreed. We would first go to Mexico to attempt one of the mountains in my project (Pico de Orizaba) plus another for acclimatisation. After Mexico we would fly to Bolivia to cross the Uyuni Salt Flats and then drive over the border into Chile. From there the plan was to attempt a series of volcanoes in Chile and Argentina – Llullaillaco, Ojos del Salado and Pissis – before having a go at South America’s highest peak – Aconcagua. We departed on 3rd November 2014 and returned in time for Christmas. Blogs appear here reflect that journey. It was an experience – a cultural experience, a sensual experience, a learning experience. 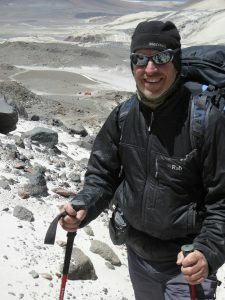 It was an experience of great joy (summiting Pico de Orizaba and Ojos del Salado) and disappointment (my high altitude cough and failing to reach the summits of Llullaillaco and Aconcagua). Since then I continued with my project by climbing Mount Damavand in Iran and Mount Elbrus in Russia. “Mount Elbrus?” I hear you say “But you just said that you climbed that in 1996!” Well, yes I did… sort of. On summit day on that trip we reached the saddle between the west and the east tops. At this point our guides told us that we would be taken up the (lower) east top. Excuses concerning the weather and route finding were given. The weather was not that bad, no worse than what one would experience in a Scottish winter. But the decision had been made. It was a decision that had rankled ever since. In terms of my project, it was necessary for me to reach the (higher) west top. This I achieved on a very windy, extremely cold but clear day in July 2016. So what was this project? The aim was to climb the highest volcano on each of the seven continents. As far as my researches could tell only ten or so people had ever achieved this aim before me. This blog has details of all of the climbs (other than the first, Kilimanjaro in February 2014, where there is just a brief blog). I achieved my objective in January 2017 with an ascent of Mount Sidley in one of the remotest parts of the world, Marie Byrd Land in Antarctica. So I am the first British man to complete the volcanic seven summits (and possibly the first Briton). There are links to the climbs in the tables below. A list of those who have climbed all of the volcanoes can be found here. Happy reading and thanks for visiting. Please leave a comment. You can find many blogs of various other climbs I have undertaken on this site together with occasional other journeys and musings. Links for some are embedded in the lists below. Ağrı Dağı (Mount Ararat) Turkey 16,854ft (5,137m) To be attempted, though the current political situation in north east Turkey means that an ascent is unlikely. Fuji-san Japan 12,388ft (3,776m) To be attempted. Mount Etna Italy 10,902ft (3,323m) To be attempted. Vesuvius Italy 4,203ft (1,281m) To be attempted. Oh and finally, an explanation. What is this Clach Liath about? Well they are two Gaelic words (and a bit of a play on words at that). Clach means ‘stone’ and Liath means ‘grey’. An apt description of me perhaps…? A fuller climbing resume can be found here.